Some time ago I wrote an article about how to treat groups of associated, related properties of a Real World Object ["RWO"] when representing it by an object ["PWO"] in PHP. We assumed that the property description of a certain object class is done with the help of a so called "SCHEMA" (a file with a list of definitions and rules or Schema program using definitions saved in a database Schema table). A SCHEMA is specific for a PWO class. A SCHEMA defines object relations, object properties, the relations between certain object properties, the relation of object properties with database fields and of course the type of each property, the property's own properties as well as associated constraints. Such "SCHEMATA" would play a central role in a web application as they encapsulate vital structural and detail information about objects and their properties. Every object constructors would refer to an appropriate SCHEMA, as well as web generators for the creation e.g. of form or web template elements would do. Actually, any reasonable (web) application would of course work with multiple SCHEMATA - each for a different object class. SCHEMATA give us a flexible mode to change or adapt a classes properties and relations. They also close the gap between the OO definitions and a relational database. Split the SCHEMA-information for properties and related database fields into several "SLAVE-Schemata" which would be built as sub objects within the MAIN SCHEMA object. Each SCHEMA would describe a certain group of closely associated object properties. Create and use "SLAVE PWO SGL objects" as encapsulated sub-objects in a MAIN SGL PWO. 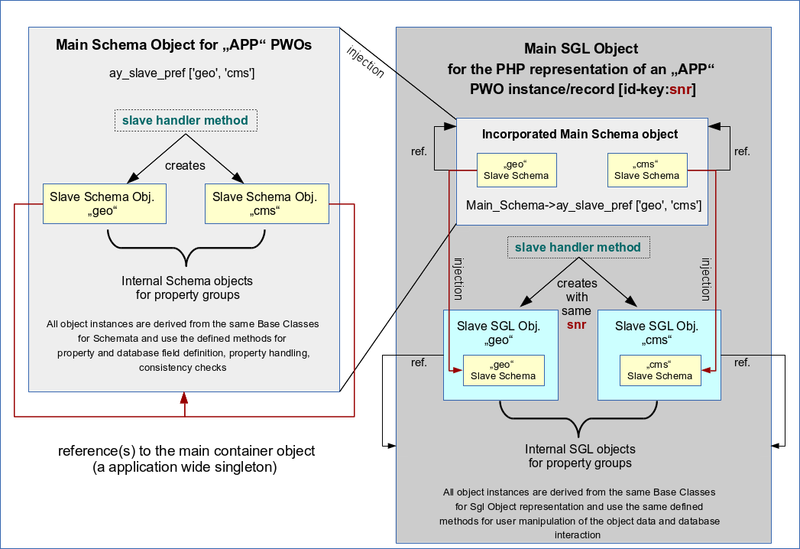 Each SLAVE PWO object gets it's own properties defined in a related SLAVE-SCHEMA. Each of the SLAVE PWO objects receives it's knowledge about it's individual SLAVE-SCHEMA by an injection process during construction. In the named article I had discussed that one can iterate methods for complete database interactions over the MAIN and the SLAVE objects. The same is true for interactions with POST or SESSION data in a CMS like web application. So, there is no need to rewrite core method code originally written for objects which comprise all object properties in just one property/field-SCHEMA without any SLAVE objects. At least with respect to field checks and database interactions. This works if and when a SGL object is derived from a base class which comprises all required methods to deal with the database, POST and SESSION data. Each MAIN or SLAVE SGL PWO knows itself how to store/fetch it's property data into/from database tables (or $_POST or $_SESSION arrays) and uses the same methods inherited from common SGL base classes (= parent classes) to do so. I have meanwhile introduced and realized this SLAVE PWO and SLAVE SCHEMA approach in a quite general form in my web application framework. In this article I briefly want to discuss some unexpected consequences for HTML generator methods in a web or CMS context. (X)HTML-Generator methods - where to place them ? When you design CMS like web applications you always have to deal with Template [TPL] structures and objects that fill the templates with reasonable formatted contents. The contents may be just text or images or links inserted into template placeholders. In more complicated cases (like e.g. the generation of maintenance masks with forms), however, you may have to generate complete HTML fragments which depend on property/field information given in your respective SCHEMA. TPL aspects may become very specific, so the methods may need to know something about the TPL structures - and this is nothing that I want to incorporate into the OO representation [PWO] of real world objects. Over time I have developed a bunch of generator methods for all kind of funny things required in customer projects. The methods are defined in base classes for Template Control Objects and or special purpose sub classes injected into TCOs. A TCO knows about its type of TPL and works accordingly. (By the way: With Pear ITX or Smarty you can realize a complete separation of (X)HTML-code and the PHP code). (X)HTML-Generator methods - which MAIN or SLAVE PWO and which MAIN/SLAVE SCHEMA are we dealing with ? In addition to some property/field identifiers a (X)HTML generator method has of course to know what SGL PWO and what SCHEMA it has to work with. This information can be fetched either by the TCO due to some rules or can be directly injected into the methods. However, in the light of a more general approach this appears to be a too simplistic idea. A HTML generator method needs to know the qualities of certain OO properties and associated database field definitions. In our approach with MAIN SGL PWOs comprising composite SLAVE SGL PWO objects each SGL object knows exactly about its associated MAIN or SLAVE Schema object. To work correctly the generator method must get access to this specific SCHEMA. This would in a reasonable application design also be valid for PWO objects representing other, i.e. different types of RWOs. the SCHEMA describing the qualities of the object property and related database fields. This would in our approach also be given for our SLAVE SGL objects or any PWO as soon as we inject it into our generator method. Do not assume that there is only one defined class of PWO SGL objects that the Template Control Object TCO needs to know about and needs to apply it's generator methods to. Instead enable the (X)HTML generator methods of a TCO to be able to work with any kind of PWO and its properties - as long as the PWO provides the appropriate SCHEMA information. These recipes give us the aspired flexibility to deal with properties both of SLAVE objects and objects of a different PWO class. The injection is a small but structurally important difference in comparison to the database interaction methods directly incorporated in SGL objects or better their base classes. Here the TCO (!) method must receive the required information - and we gain flexibility when we inject the SGL object into it (plus information identifying the property for which a HTML fragment has to be generated for). Had I respected the rules above already some time ago it would have saved me much time now. Now, I had to adapt the interfaces of many of my generator methods in my TCO base classes. In case of doubt do not hesitate to use loose object coupling via injection on general methods which could in principle be applied to more and other objects than the ones the object containing the method knows about at the time of your class design. i.e., when you inject something the present object containing the method knows about already. It will save time afterwards when iterator patterns over other objects have to be used and when you may access the (public) method from outside, too. We just have to iterate the usage of the generator method for the properties/fields of the MAIN SGL PWO as well as its SLAVE SGL PWOs. By getting the SGL object injected the method also knows about the right SCHEMA to use and provide required detail information for the generation of related HTML code (e.g. for a form element). and apply the generator method by injecting the relevant property identifier plus the MAIN/SLAVE-SGL object in question. The principle of iteration over SLAVE objects is actually nothing new to us: We used it already when dealing with the database interaction methods. (It is a basic ingredient of a composite pattern). and which is filled in course of the construction process of a PWO. When realizing a composite pattern in the form of SLAVE objects (with SLAVE Schemata) to deal with closely associated property groups of complex objects you can apply existing base class methods and iterate over the SLAVE objects to accomplish complete transactions affecting all properties of a structured PWO. This principle can be extended to (X)HTML generator methods of Template Control Objects, if these methods are prepared to receive the SLAVE SGL PWO objects by injection. If we only want to apply generator methods on a bunch of selected properties, we should use an array associating each PWO property with a SLAVE PWO SGL object. The use of the SQL command "LOAD DATA INFILE" may accelerate the import by a factor of at least 18 in comparison to reading the data line by line with fgetcsv() and inserting single records into the database table. The creation of a (small) helper table may often be useful to improve the performance of repeated consistency checks based on the evaluation of "derived result sets" from COUNT(DISTINCT ...) subselects or subqueries on big tables. The first point implies a straightforward use of "LOAD DATA INFILE" in your PHP programs. The second point may be applicable if certain data structures are given and it requires a balanced use of indices. A possible splitting of the import process into several sequential processes. Instead of loading one big file we may rather distribute the data records over several files. Each individual process loads data from just one file; so the data are loaded file after file into the table. The impact of index creation on the data import time. Reasons for a sequential data loading from multiple csv-files are: Better control of the loading process due to shorter times for well defined data packages and also an adaption to memory limits. However, without tests it is not clear whether such an approach may have an impact on the overall loading performance. This article provides some numbers from test runs for both measures. We shall see how the combination of both points influences the overall performance of the data import. Furthermore, an optimized loading process may influence your strategy regarding consistency checks during a sequential loading of several files. I briefly have a look at some of the aspects of loading data from a sequence of files. In the article PHP/MySQL/Linux: File upload, database import and access right problems I have already discussed that one may split the data to be imported into bunches of records and distribute them over several files. I have pointed out that the data splitting shall not be done by fields. Instead records should be distributed over multiple files; but each record should contain all of the associated (!) fields if you want to profit from the performance of "LOAD DATA INFILE". m,n,i shall represent keys which together form an unique key of each record. An [m,n]-combination may e.g. define an object called "node" and [i] may represent time periods. Let us further assume that after having loaded one file you for some reason want to check the complete SUM (Q2) over all (!) i-values for each "node" before you (or a PHP program) import the data of the next file. Then you must organize your data such that all records related to one and the same node are placed inside exactly one file - otherwise you would get a moving target for your SUM when loading your files. In general, the distribution of the records over several files must comply with logical conditions if you want to work with the data already during the loading process. Another aspect of distributing records over several files may be memory considerations: In one of the articles named above we saw that the loading and index generation consume more and more memory for buffering as the absolute numbers of records grow. Therefore, if you want to avoid conflicts with limited RAM, it may be reasonable to load bunches of records (in form of several csv-files) instead of processing on one gigantic file with "LOAD DATA INFILE" . In most cases the central objective of using data packages is a better control of the file transfer and loading processes: With multiple files you can build up a "file pipeline" on the server. The files in this "pipeline" are handled by a repeatedly running import job. The required time interval to transfer each file to the server and load its data into the base can be limited to a reasonable value by choosing an appropriate number of records per file. After each file is processed on the server you may analyze the new table status, the pipeline status and send success or failure messages to the client (e.g. a browser). With a web client the communication exchange can be managed by Ajax. A sequential loading of files also provides you with the possibility to fill the file pipeline on the server in parallel to loading data of already completely received files into the database. Despite a more complicated communication structure between a browser client and the server you can still keep control over both the transfers from the client to the server as well as over a sequence of server processes loading loading data into the base - file by file. A web client starts an Ajax controlled PHP job that analyzes the number of files in a pipeline (a special directory) on the server and chooses the next file to import by some given rules. After having loaded the data the job returns control to the client and sends information about the processed file, the loaded number of records and the new status of the database table. Depending on parameter settings there and of course depending on the quality of the status information from the server a new server import job for the next file may automatically be started from the client with the help of Ajax from the client. This continues until the pipeline is empty. The last job may create required indices on the filled database table - depending on user settings. Is the total import time independent of a record distribution over multiple files? with or without a parallel building of (unique) indices on defined columns. that perform the creation of required (unique) indices only AFTER all records have been loaded into the database table. a unique index (with auto-incrementation) on the column "nr"
a unique index defined for the columns "[n,m,i]"
creating them after having filled the table with data. Importing one csv-file with all 5 million records. Sequentially importing 2 csv-files - one with 3 million records and one with 2 million records. The accuracy of the response times is in the range of a second - depending on the general situation on the virtualization host and its disk system at the measurements. The response times do not include any file transfer times between the client and the server in our LAN. However, the response time for the situations with a sequential load of several files includes some common Ajax overhead in all cases plus the time to load the PHP program files into our Apache server again. But the system buffers and caches sufficiently. So, the interaction between the client and the server should only have a marginal impact. Rule 1: Any unique index built during "LOAD DATA INFILE" reduces performance (due to checks which have to be performed). So, one should carefully check whether a unique index really is required later on when you work with the data. Rule 2: The total import time for several or one big file are comparable if a unique index is created whilst or after data loading. Rule 3: Any building of a non-unique index during the import increases the total import time for a sequential load of several csv-files in comparison to a loading process for just one big csv-file. Rule 4: Without any index defined the total loading time for several files is comparable to the loading file for one big csv-file. The most surprising effect for me was that described in rule 3. However, regarding the accuracy in the range of a second we may have some doubts whether we see a real effect. So, we should have a look at a situation with more data records and more files to confirm this rule. Now, it will of course be interesting to see a comparison between different loading processes with a creation of the [n,m,i]-index AFTER the processing of all files with "LOAD DATA INFILE". For such cases technically we drop any index before we load any file data and create the index only after the data of all files have been loaded into the base. Note, that index dropping may take some time, too. Table: Comparison of server response times for index creation AFTER and WHILST data loading 5 million records with "LOAD DATA INFILE"
The first time value given in the last four lines includes an index drop time which varies a bit according to precise server conditions at the time of measurement. The most interesting result is that the differences measured between a sequential load of several files and a situation with just one big file almost to disappear when we create the index after the pure data loading. Now, let us turn to 10 million records and an equal distribution of records over 5 files (with 2 million records each) and see whether we confirm our results. For the test we have just doubled the number of nodes in comparison to the 5 million case. Table: Server response times for loading 10 million records with "LOAD DATA INFILE"
Again, we see the huge impact of the creation of an unique index - but the total loading time is almost independent of whether you create the index whilst or after the data loading. This is understandable as the required checks for a uniqueness must be done in both situations. There is a big difference between a sequential loading process for several files and a loading process for just one file, when a non-unique index was created whilst loading with "LOAD DATA INFILE". Note in contrast the considerable reduction of the required time if you create the non-unique index after all data have been loaded into the database. The measure discrepancy in total loading time is really remarkable - and actually I have no convincing explanation for these findings. The tree structure of the index is quite simple; I do not really see what costs the overhead. And I have tested the effect several times to exclude any extraordinary conditions on the server. I have also validated parameter settings and the steps done during the sequence of loading steps to exclude any unplanned work or actions on the server. The [n,m,i] index in my case has a size of 215 MByte; the data themselves take another 400 MByte. All in all we speak about 600 MByte. So, I suspect some reading and writing from/to the disk at the end/beginning of the individual 5 loader jobs and some inefficient memory management. I have not yet investigated this in detail. Write me a mail if you know the reason. Independent of the reasons: For me, it was really important to see this difference because I do not need a unique index and I want to work with many more files to cover much larger numbers of records. You should avoid the creation of a non-unique index whilst using "LOAD DATA INFILE" on multiple files by sequentially started (PHP) jobs on the server instead of loading just once from one file. Whenever you load your data from several files create the index after all data from all files have been imported into the database table. In the article MySQL/Aggregation: Comparing COUNT(DISTINCT) values on big tables I discussed the creation of a helper table and respective indices to get a good performance of consistency checks. Most of these consistency checks were based on an analysis of derived result sets for "SELECT COUNT(DISTINCT ... ).. " statements. My basic idea was to perform such checks after each import process when dealing with a sequence of files. However, in the named article I also showed that a fast creation of a helper table required already some existing index on the big data table. But our present results favor a solution where an index is created only after all data of all files have been loaded. So, no intermediate consistency checks in between the loading processes for two csv-files ! After some thinking I came to the conclusion that this is no big disadvantage. Even if you consistency checks only after all data have been loaded, you will still be able to identify the records which are problematic. And with some effort, data and file analysis - which will cost some extra time, but maybe worth it - you even may find the file from which the record was loaded. So, you can give the user who tried to load the files a full report on the suspicious records and that caused inconsistencies and the files that contained them. We have tested different combinations for loading data with one or multiple files and with or without creating indices during/after the data loading. Our tests have shown that if you import data sequentially from several files and you want to create a non-unique index over some columns, it makes a huge difference whether you create this non-unique index during or after the sequential "LOAD DATA INFILE" processes. One should avoid creating such indices whilst loading the data with "LOAD DATA INFILE". It should be created after all data from all files have been imported into the database table. In contrast such an order of steps does not seem to be required when creating unique indices. However, a unique index costs in general significantly more time to be created than a non-unique one. You, therefore, should evaluate the necessity of unique indices. In this article I want to list and briefly discuss some resource limiting parameters for PHP that may become important when big data files are transferred to a server and afterwards imported into a database. Before I do that, I first want to discuss a related comment of reader. In one of my last articles [Importing large csv files with PHP into a MySQL MyISAM table] I recommended using the SQL statement "LOAD DATA INFILE ..." inside PHP programs to import big csv-files into a MySQL database. In addition I recommended to deliver all fields of a record with the same key dependency in one file instead of distributing data fields of records over several separate csv-files and import these files in maybe several separate (denormalized) database tables. I agree - but only partially. In my case the file size was around 35 MByte. To upload such a file with ADSL and a maximum upload rate of 1MBit gives you an effective 5 minutes upload time (better transfer time to the server). The transfer time has to be compared with the data import time on the server itself which turns out to be in the region of 6 seconds when using the "LOAD DATA INFILE" directive. The time difference will get even bigger for larger files. So, we see that the transfer time may soon become a dominant factor when our server is located somewhere in the internet. The question arises, whether required upload times may collide with server settings. This would be one example of a server side resource limitation we need to deal with when working with big data. We come back to a potentially relevant, but disputed parameter later on. or try to organize the data records in such a way that they can be uploaded to the server and imported into the data base sequentially - i.e. by files with the full data field spectrum but with reduced record numbers. I would not give up the idea of transferring csv-files with as many fields as possible per record line - as long as this is compatible with a normalized data model. Point 2 can be realized very often without problems - and with Ajax and HTML5 technologies it can even be solved in such a way that the transfers are automatically done one after the other (file pipelines). So, if you want to limit the transfer times, split the data by records and not by fields. I.e. transfer several files with bunches of records instead of several files with fewer fields. Nevertheless, relatively big transfer times for big files may conflict with some server settings. Also - and more important - the time required for the import into the database or the file size and memory consumption can conflict with limits set on your server. E.g., the maximum time a PHP job is allowed to run on most web servers is limited - as are many other resources given to a PHP job. Many of the PHP resource limitations we may be confronted with on a Apache Web server are defined by parameter settings in a php.ini-file. On a SuSE system this is typically located at "/etc/php5/apache2/php.ini". Many providers deny access to these global settings - although one could in principle influence them for certain scripts by .htaccess-files or by putting php.ini files into the directories where your PHP-scripts reside. This is one of the reasons why I urge my customers to rent a root server or at least a virtualized server of some provider when seriously dealing with big data. You need to have control over a variety of server settings. Sometimes also general settings and not only php.ini-parameters. Working with big data files and applications dealing with tens or hundreds of millions of records in joined tables require full server control especially during the development phase. This is in my opinion nothing for simple web site hosting. The time numbers are given in secs. The memory numbers in Megabytes. Most of these parameters are mentioned in the following web articles which comment their impact on file uploads. Please, have a look at these web pages. Both of these parameters have to be set consistently when dealing with file uploads. (Actually, in the past I sometimes forgot that myself and wasted some time with wondering why a file did not get loaded although I had set a sufficient value for upload_max_filesize). When you upload a file plus some additional POST data the total amount of POST data can be bigger than just the file size. However, "if the size of post data is greater than post_max_size, the $_POST and $_FILES superglobals are empty" - according to the PHP manual. You may even get no warnings or errors in some situations. Therefore, the value of "post_max_size" should always be bigger than the value of "upload_max_filesize" - and the latter should of course be at least as big or a bit bigger than the size of the file you plan to transfer to a server. An important parameter is also the "max_execution_time". It limits the time a PHP process is allowed to run. It should be big enough to cover the file handling and database import times on the server. Transfer times are not included if we believe the hints given at http://php.net/manual/de/features.file-upload.common-pitfalls.php. Warning - max_input_time sets the maximum time, in seconds, the script is allowed to receive input; this includes file uploads. For large or multiple files, or users on slower connections, the default of 60 seconds may be exceeded." "Parsing" refers to the time interval between the arrival on the web server and before a PHP script starts executing - so "max_input_time" would not include the upload time (= transfer time to the server). However, it would include the time to prepare the superglobal arrays as $_GET, $_POST, $_FILE. This interpretation makes some sense to me. However, I did not test it thoroughly. I have no definite opinion about this discussion, yet. In two of the articles listed above one can see that even the error messages referring to conflicts with the max_input_time parameter can be misleading as they wrongly refer to the max_input_time. Therefore, I recommend be aware of the parameter "max_input_time", although the default should be sufficient for most cases. Setting it to "-1" corresponds to an unlimited max_input_time interval - whatever it really has an impact on. If you really work with huge files of several hundred megabytes even the garbage collection time may become important. gc_maxlifetime sets a life time limit for data until the system regards them as garbage. So, if your import or data handling times get big enough also this parameter must be adjusted. The "memory_limit" of a PHP-Scripts may also be reached when processing huge files. So, you see there is a whole bunch of parameters which you may need to adjust when you start working with larger and larger files. You find typical settings of php.ini-parameters for the web hosting packages of the providers Strato and 1&1 here.